Gems of the seine river cruise trip will give you a beatiful experience of sail along the majestic seine river through landscapes that have inspired artists for generations. This tour program seize the opportunity to take easy paced bicycle rides at your leisure through spectacular scenic villages and the feel of french culture. No reviews yet for this trip. Browse other reviews below for Scenic Cruises. On arrival into Paris be met and transferred* to the luxurious Scenic Gem. Tonight enjoy a Welcome Reception on board. SCENIC FREE CHOICE (1) tour the magnificent Palace of Versailles; or (2) guided visit of the Louvre; or (3) walking tour with a local Parisian; or (4) ‘Shop with a Chef’ when you visit a local food market including tastings . This afternoon, enjoy time at leisure before sailing to Les Andelys. SCENIC FREE CHOICE (1) hike to King Richard the Lionheart’s Château Gaillard; or (2) journey to Lyons la Forêt, one of ‘the most beautiful villages of France’, including cider tasting. Afternoon cruising to Rouen, passing through the inspiring landscapes made famous by impressionist artists such as Claude Monet. SCENIC FREE CHOICE (1) a walking tour of Rouen including the famous Joan of Arc sites and Rouen Cathedrale; or (2) enjoy a cooking demonstration at an acclaimed French Baking and Patisserie Institute; or (3) hike to Saint Catherine Hill for the views that inspired Monet’s Panorama of Rouen. With your afternoon at leisure, why not explore Rouen with Scenic Tailormade. Rouen is most known for its historical ties to Joan of Arc, where in 1431 this renowned heroine was accused of heresy and burned at the stake. SCENIC FREE CHOICE (1) a full day excursion to the Somme battlefields, location of the Battle of the Somme which claimed the lives of more than 150,000 soldiers from Britain and the Commonwealth in WWI, including a visit to the Australian National Memorial near Villers-Bretonneux; or (2) visit the meticulously presented Museum of Fine Arts. Why not step ashore with your Scenic Tailormade personal GPS device this evening and wander this illustrious city by moonlight. A fabulous morning of sailing is assured with Scenic Tours, the only river cruise company to sail toward the open waters of the English Channel to Honfleur. Glide under Pont de Brotonne, the oldest bridge of its kind in the world, and Pont de Tancarville suspension bridge, two of only three bridges spanning the Seine river beyond Rouen. SCENIC FREE CHOICE (1) a walking tour of Honfleur; or (2) discover the rural beauty of Normandy’s Cider Route on your visit to Domaine Saint-Hippolyte including a cheese and cider tasting. SCENIC SUNDOWNERS Enjoy an afternoon cocktail with your fellow travellers in this picturesque pocket of France’s Normandy region. SCENIC FREE CHOICE (1) join a full day excursion to the D-Day landing beaches of Normandy including the Arromanches Landing Museum and Omaha Beach cemetery and memorial; or (2) tour the playground of the rich and famous in Deauville, including a tasting of the regions renowned Calvados. 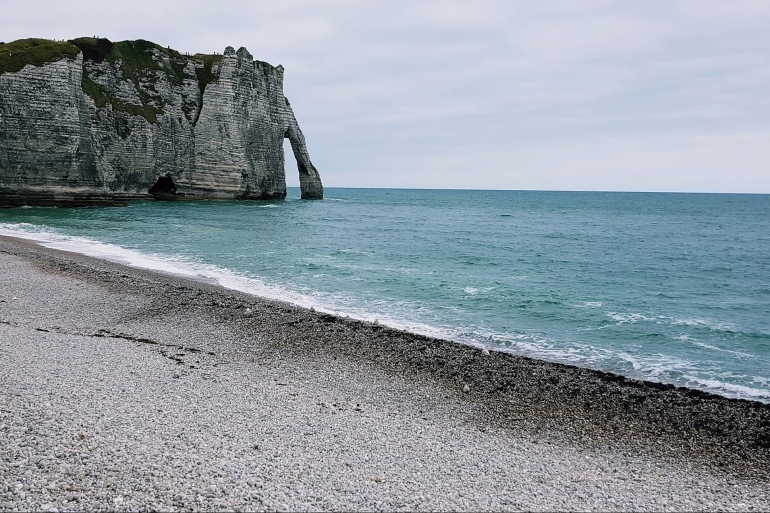 SCENIC FREE CHOICE (1) tour Fécamp, set atop spectacular limestone cliffs, including a visit to the Benedictine Palace to taste the famed liqueur; or (2) travel to the delightful hilltop village of Bolbec and visit the fascinating Textile Museum. Back on board the opulence of the Scenic Gem, relax as the riverside panoramas come to you as we sail towards Vernon. This region of France gave rise to the Impressionist era and as such is famous for having evoked many beautiful paintings by some of history’s most famous artists. SCENIC FREE CHOICE (1) visit Giverny, including entry to Monet’s former residence and gardens; or (2) for the more adventurous enjoy your self-guided cycle from Vernon to Giverny including entry to Monet’s house and garden; or (3) tour the picturesque streets of the river-side town of Vernon with your guide. SCENIC ENRICH Enjoy a private classical concert within the grandiose Château-de-Champlâtreux, a 16th Century estate once belonging to nobility and set in the most magnificent surrounds, this unforgettable event is exclusive to Scenic Tours guests. SCENIC FREE CHOICE (1) visit the charming village of Auvers-sur-Oise including entry to Vincent van Gogh’s room; or (2) step inside the magnificent Chantilly Castle for a guided tour of this remarkable château set amidst beautiful parklands. This evening enjoy a farewell dinner on board. Ensure you have your cameras at the ready as you view the magnificent lights of the Paris skyline, pierced by the iconic Eiffel Tower, on your cruise into this romantic and most visited city in France. Disembark your cruise after breakfast this morning for your transfer* to Paris airport for your onward or homebound flight.